This month has been full. We kicked off the month celebrating our 5 year anniversary! These past 5 years have certainly flown by! To celebrate, we took a day trip to Cold Spring, NY. 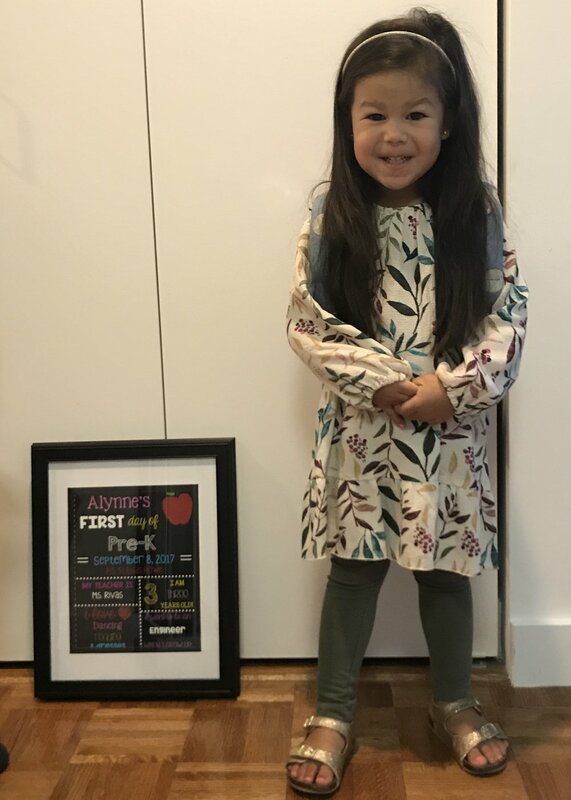 Later that week Aly started her first day of school, pre-k! (More about that below). Then we went on our annual apple picking trip to Harvest Moon Farm & Orchard. It is one of our favorite trips we take each year. As the kids get older, it gets more and more fun! Both kids loved picking apples, and it's always such a great time with friends. Fynn, you have been such a joy this month! It is our first month just Mami and Fynn at home during the days. I'll admit, I was a little nervous about what this time would look like, but it has been so great. You and I are both loving the extra one-on-one time together, and you quite enjoy having uninterrupted access to all the toys! You continue to prove how flexible you are in life. You seamlessly transitioned to the new school schedule as well. I had to move your nap up an hour sooner and cut it an hour shorter, and you took it all in stride no problem. ANDDDD you are now napping in your big boy bed!! It took you only 2 days to get that down, and you have napped there ever since! Night time is a whole different story though haha. I think because Aly is in there with you, you decide you want to get up and try and see her and play around the room, so you haven't made in a night in your bed yet! Also, you love walking to pick Aly up from school. One day, Papi put you down for a nap, and since it was the weekend, he was letting you get some extra sleep. When it was time to go to church, he went in to get you, and you were just quietly sitting on the edge of your bed waiting for him to get you! Later I asked you about it, and I said, "Were you just sitting in your big boy bed?" "Yeah." "So why didn't you call for Papi?" "I don't know!" You have the biggest imagination. I can't believe you are already role playing and acting out "conversations" with your toys. I could sit and watch you play in your own little world for hours! You like to say, "ummmm, Papi. ummmmm Aly. ummmmm Mami." You are starting to use your own name now! You will often mention "Fynn" when talking about our family now. You can say the entire prayer we taught you now without any help. It is precious! You are really getting the hang of counting. I have caught you several times counting things unprompted. You can count objects up to about 3, and you can count to 10! You are doing so well in Tot School and you love getting to do all of the activities, and you love using dot markers, particularly the color blue! The other night, you said "C'mon babe!" to Papi after hearing me say it! lol! You repeat every word you say a good 2-3 times--eat, eat, eat. go, go, go. loud, loud, loud. We love you so much buddy! I can't believe next time I write, you will be TWO!! Love you! Alygator, what a big month for you!! You started your very first day of school! You go to P.S. 51 Elias Howe (right next door to our apartment), and your teacher is Mrs. Rivas. You absolutely love going to school. You're never ready to leave when I pick you up, and you always ask to go to school on the weekends. We have been so proud of how well you're doing at school. 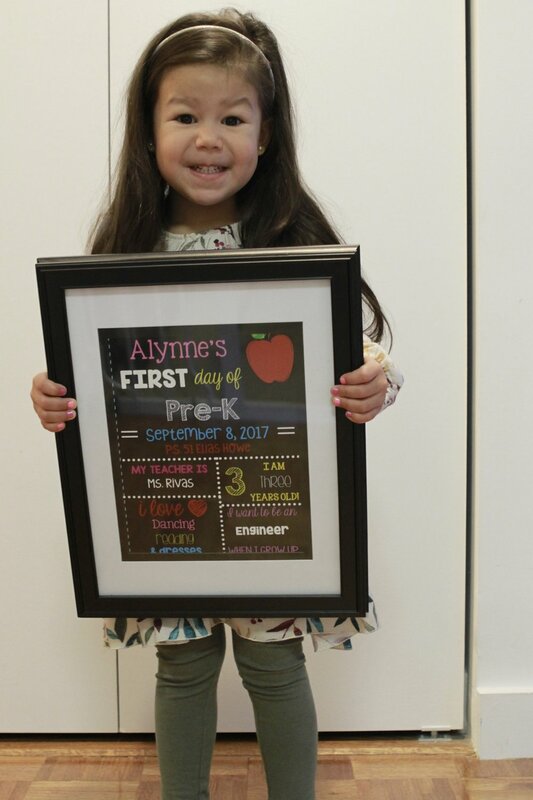 You are one of the youngest kids in the class, still being 3 (in NYC, the cutoff for pre-k is Dec 31), and you had never been away from home before. But that hasn't stopped you! I thought for sure you would be a shy little thing, but I have been surprised that it turns out you are quite the social butterfly in school (you get that from Papi for sure!). You like to make friends with everyone in class. The only thing that has been hard with the school transition is the evenings. And we fully anticipated this. You went from napping two hours, to no nap and a very full day, so of course you are exhausted by the time evening rolls around! We are continuing to work through it, it's a good growing time for all of us! One night, in the midst of a hard evening, you said, "Papi, can you show me grace?" On the first day of school, you asked to have one of everything at breakfast time and had juice and chocolate milk that day. No wonder you liked school so much!! One day you said, "What are you doing in the world?" instead of "what in the world are you doing?" Too funny! 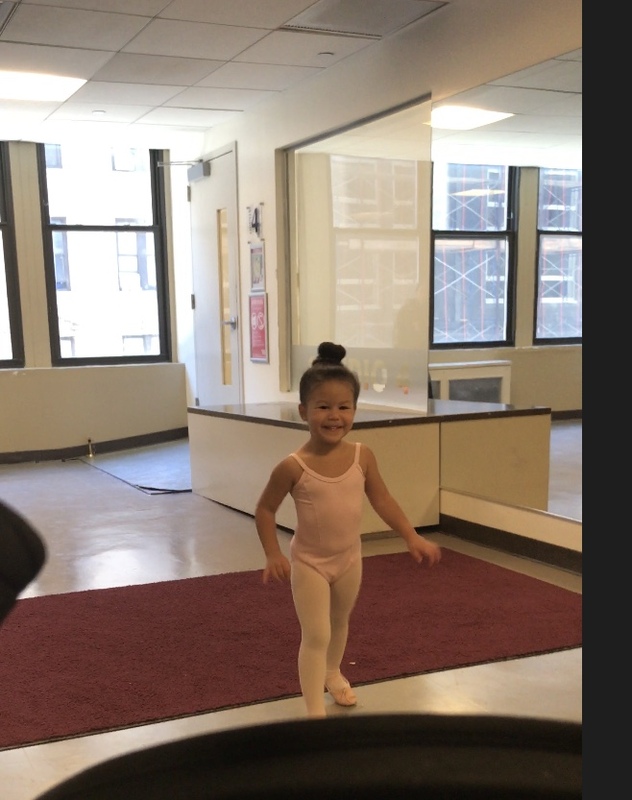 You also started ballet and tap class this month! You are at a new studio this year, since we moved--Broadway Dance Center. You love that you get to do tap this year too! And you also love that the new uniform is full of your favorite color, light pink! "pond of your hand" is something you said this month. You learned how to play checkers this month and love it! You are such a fun, silly, thoughtful, and caring little girl! We are incredibly proud of who the little girl you are becoming! You love God, your family, and genuinely care for everyone around you. Love you sweet girl! Governor's Island fun with Papi! Heading up to Cold Spring for the day! When Aly steals your phone! Fynn going down the big slide for the first time by himself! I love Fynns little imagination!